Eyelash perming is one of those beauty trends that probably baffles the average dad. And while the name does make this process sound bizarre, its purpose is actually the same as the humble eyelash curler: to add curl and lift to the eyelashes. When an eyelash perm works, lashes should look fuller, longer and curlier for a period of up to two months. But are those benefits worth the risk? It's hard to say. Don't settle back into an esthetician's chair until you know exactly what the perming process involves. There are some variations in the technique depending on the service, but generally the perming process starts with the esthetician placing protective cream and small curved pads or rollers on the eyelids. Next, the eyelashes are coated in glue and pushed up against the curved pad. The glue keeps them in place while a curling solution is applied. The solution stays on for 10 or more minutes and should be followed by a second solution. Then the solution is washed off and the pads are removed, leaving lashes with that freshly-curled look. There's a lot of variation in eyelash perming services. Some salons offer a lash lift, which uses basically the same process and yields similar results to a lash perm. Sometimes the service includes the option of adding a lash tint or a keratin solution, which is supposed to thicken and lengthen the hair. Clients may have a choice of different size rollers that yield different effects. Don't start the process until you know exactly what the esthetician plans to do. Waking up with picture-perfect eyelashes is delightful, but is getting that result worth the risks? The FDA hasn't approved any of the lash perm or lift products used in the U.S., which isn't exactly comforting for anyone considering this process. 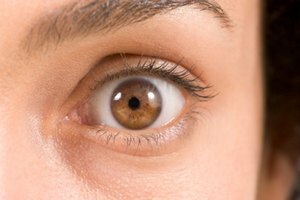 There's some risk every time chemicals are used near the eyes, and some people report swelling, irritation and burning of the eyes after lash perms or lifts. Anyone with sensitive skin should be wary about these treatments. If you do decide to go for it, book an appointment with a licensed esthetician at a clean, well-rated salon. Never use an at-home perm or lift kit. Getting an eyelash perm might prove to be riskier than you think – not to mention, more expensive. Achieve the same results at home without putting chemicals near the eyes. 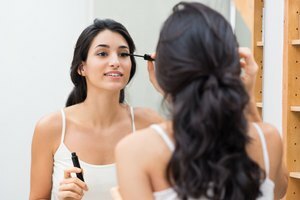 Using an eyelash curler is the gold standard for curling lashes, but it's not the only method. A brand-new toothbrush makes a great DIY curler. Run it under hot water to warm the bristles, dry them with a clean cloth and use the warm bristles to carefully push the lashes up. Can False Eyelashes Damage Natural Lashes?